Well, at least that’s what I’m telling myself after a week of being home from round two of the Enduro World Series in Manizales, Colombia. 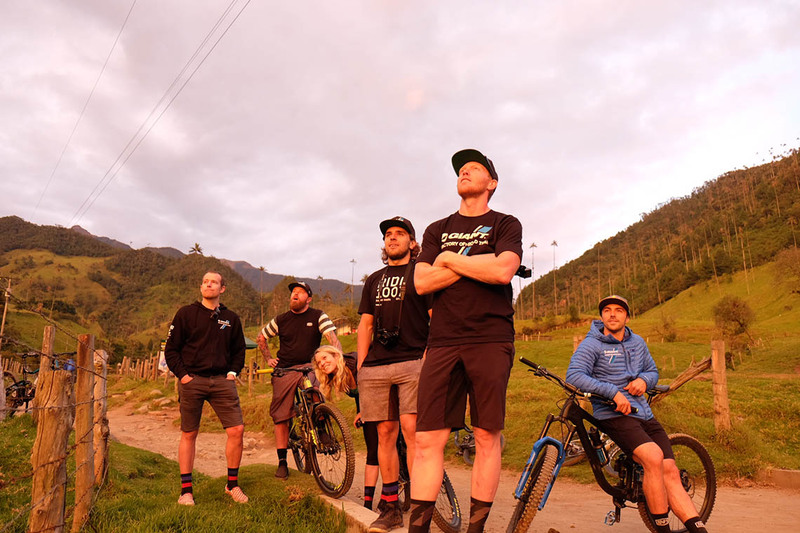 Ever since the inception of the Enduro World Series in 2013, I had a personal goal of competing at this highest level of this latest style of mountain bike competition. But the job, a new baby, work travel, family obligations—all had their way of wedging themselves between me and this goal. So when I nonchalantly entered the extremely limited lottery last fall to gain entry into a 2018 EWS event, I had near-zero expectations of being accepted. But then in December I unexpectedly received a coveted “you’re in!” invite from the organization. And so began my physical, mechanical and mental preparation for what has quickly earned a reputation as one of the most challenging mountain bike events on the planet. With that vote of confidence, I organized a personal fitness coach, began assembling a suitable race bike, and paid my entry fee. I was now fully committed to the March 31-April 1st event. Fast-forward through three months of not-so-glamorous gym work, virtual Zwift training and enduro-style weekend rides, and I found myself zipping up my Evoc bike bag and boarding Avianca flight #89 to Bogota, Colombia. Ready or not I was heading into the fray. Fortunately, I wasn’t heading to this race on my own. I had the opportunity to tag along with the Giant Factory Off-Road Team, which includes professional riders Josh Carlson, McKay Vezina, Rae Morrison and hometown special guest star, Marcelo Gutierrez (who normally pilots a downhill bike on the World Cup circuit, not a lighter weight enduro rig). 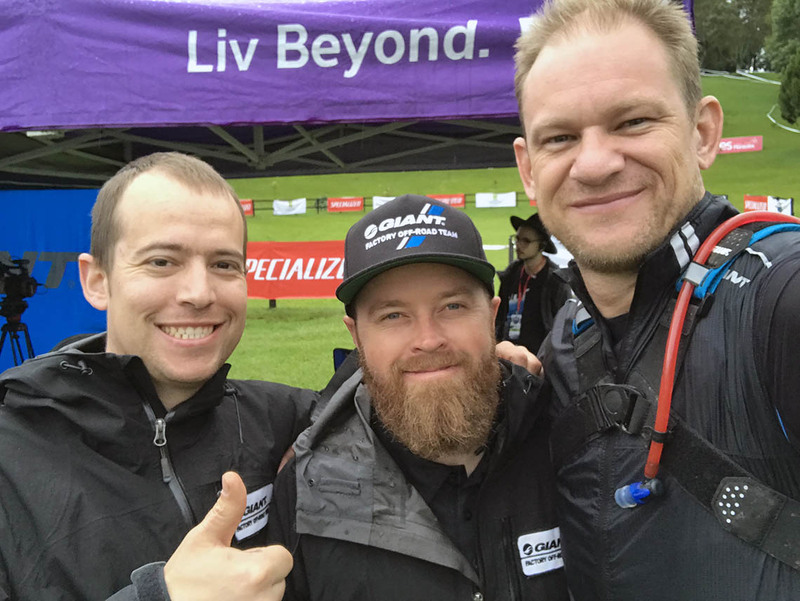 Additionally, pro mechanics Colin Bailey and Sebastian Boyington would help support the riders. 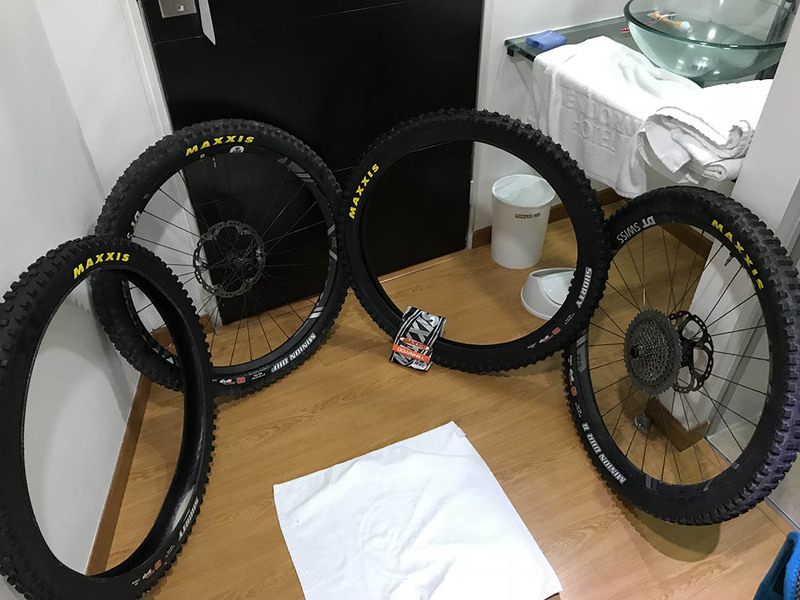 Upon meeting up with the team in Manizales (one the most flight-cancelled airports in the world due to its 7000-foot altitude, short runway and notorious weather), we promptly got down to bike building and organizing logistics. 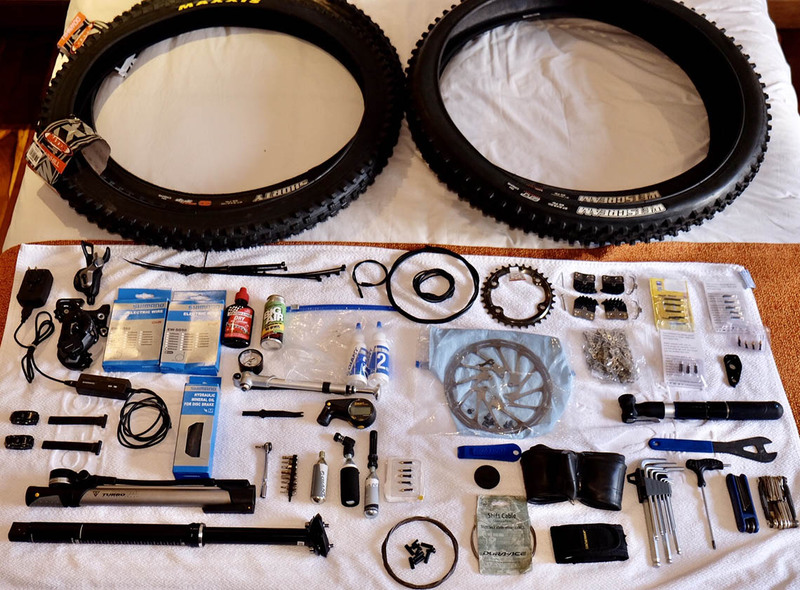 Logistics—it would be the primary theme for the week, and my biggest take-away for competing in an EWS event: daily transportation, lodging, meals, bike washing, registration, racer meetings, tire swaps, practice and…racing. I’ve attended hundreds of traditional mountain bike events in my lifetime, but none come close to the almost overwhelming logistics of a multi-day EWS enduro event. On paper, it appeared simple to me: practice Friday, Urban DH race (stage 1) on Saturday, stages 2-8 on Sunday, fly home Monday. Because I couldn’t bring a second bike, I brought plenty of spare parts. I didn’t take into account the countless sub-steps required just to make it to the start line each day. For example: because course conditions were constantly changing, numerous, last-minute tire swaps were required. These proved to be challenging as a privateer equipped with only a hand pump, a Dixie cup full of swapped sealant and a cramped hotel bathroom floor. Because I was primarily wrenching on my own bike, I would wait until midnight before the event to try and best determine how much it was raining before making my final selection: Maxxis Shorty [f] / Maxxis DHR II [r] for practice; Maxxis DHF [f] / Maxxis DHR II [r] for the urban stage; and Maxxis Shorty [f] / Maxxis Shorty [r] for Sunday’s full-blown “race day.” I also had to consider gearing for the varied events—34t for practice and the urban DH stage, 32t for Sunday’s stages. Plus bike washing, cleaning and preparation between every event. Don’t get me wrong—I love this stuff. The bike nerd/mechanic/racer in me loves the strategy of bringing the best possible equipment to the start line. I just didn’t realize how much time I would spend prepping my bike while also preparing the rest of my gear: fresh goggle lenses, clean kit, freshly stuffed hydration pack, multiple pairs of Zip-locked gloves, packed sandwiches—everything needed to be accounted for and ready to race, every morning of the event. The first event on the schedule was Friday’s practice—an opportunity for every racer to pre-ride all the off-road stages, as well as all of the transfer “liaison” stages. 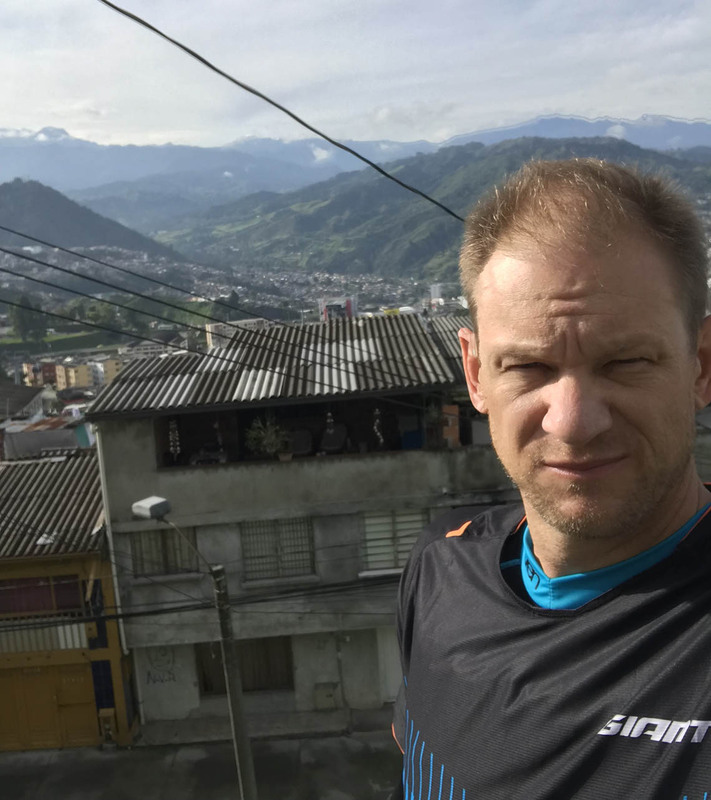 With a total of seven “dirt” stages, this reconnaissance day proved to be one of the most challenging at 25 miles and 6,300 feet of climbing—all at 7,000 feet of lung-burning elevation, under the broiling, near-equatorial sun. This day quickly open my eyes to exactly what I had signed up for—a near-seven-hour day in the saddle riding extremely challenging, muddy, jungle trails—at high speed. Or, at least, that’s what I went to bed thinking. Saturday’s Urban DH stage #1 was the big question mark for everyone. We had all watched invite-only Red Bull Urban DH events on YouTube. They were terrifying, to say the least. Would the promoter have us jump school busses and gap massive sets of stairs? Hopefully not. Contemplating the conditions before my “blind” early morning Urban DH practice run. 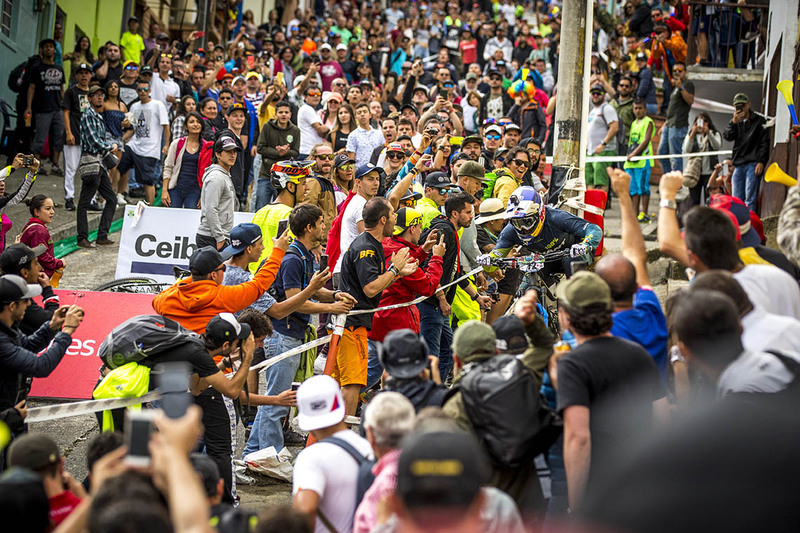 In the end, the promoter significantly tamed the Urban DH stage to make it “enduro friendly,” which was the proper choice given the field of 400 riders with varying abilities. And, in the end, the stage turned out to be the hallmark of the weekend. A sub-two minute run through the steep streets/staircases of downtown Manizales proved to be a massive hit—both with the racers and with the 20,000+ fans that lined the course to cheer us on. With our man Marcelo winning the stage, we all went to bed Saturday night with high hopes for Sunday’s true “enduro” day. Standing room only for the pro event. Sven Martin photo. And that’s when it started to rain…What I (and the rest of the team) couldn’t possibly fathom was the mud. We sampled a bit of it during practice Friday, but what we awoke to Sunday morning was borderline catastrophic. From sundown Saturday to sunup Sunday, it rained. Hard. Really, really hard. 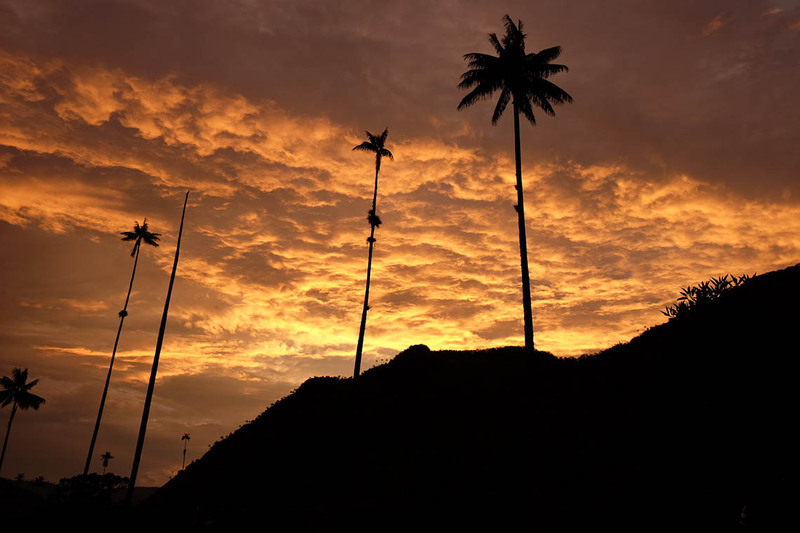 It turned Colombia’s signature volcanic dirt into a biblical quagmire of black, oozing terror. Because I was competing in the “old guys” class, I got to be one of the first competitors down each stage. I was essentially “sweeping” the ludicrous topcoat of mud away from each of the timed sections of trail. Every competitor had to delve deep into their repertoire of mud-riding skills and somehow make it down each treacherous stage. Hailing from dusty Southern California, my repertoire consisted mainly of double-unclipped “push-biking/outriggering” my way down the trail. This wasn’t mountain bike racing, it was the longest, most out-of-control Tough Mudder ever. Even the pros had their hands full. 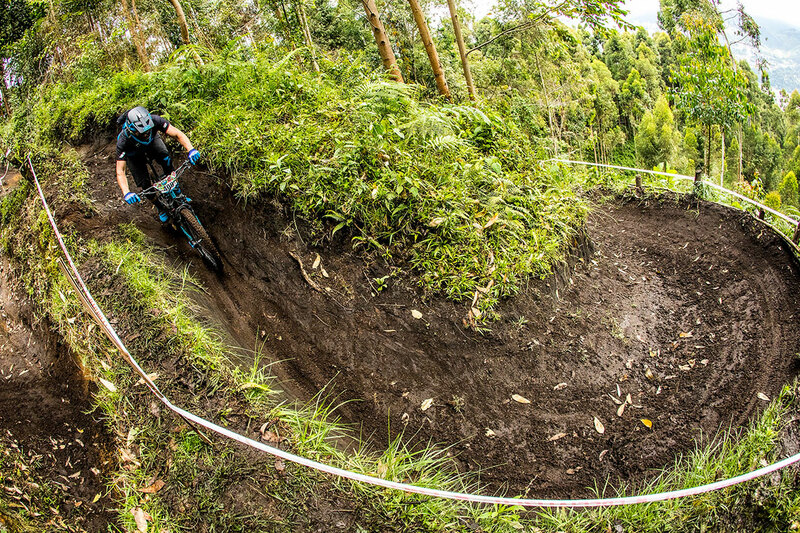 Josh Carlson plows his way through the Manizales mud. Sven Martin photo. Simply making it down the timed stages felt like a huge accomplishment, as many of my fellow competitors either crashed out, grenaded their drivetrains, or quit. Twenty six percent of my field didn’t finish. Somehow, with a bit of luck, only a few minor crashes, and a ton of perseverance, I fought my way to the stage 8 finish line and had finally completed my first EWS event. GFORT mechanics Colin Bailey and Sebastian Boyington provided equal parts mechanical and moral support. 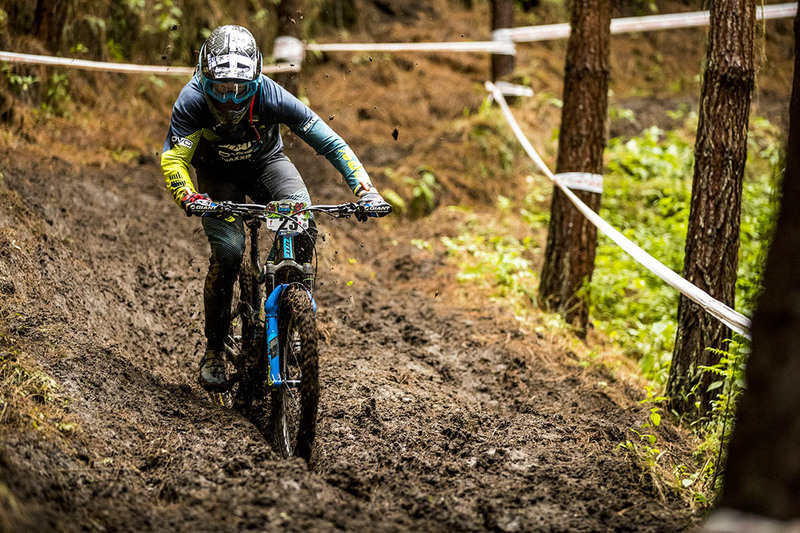 In retrospect, it was the adverse conditions that made this particular EWS memorable. It was reassuring to hear our professional racers admit that this was one of the toughest EWS events they had ever raced. And while it would have been much more enjoyable to race the seemingly awesome trails in drier conditions, I’m proud to have finished. Because if overcoming adversity is any measure of accomplishment, this experience was a huge personal success.